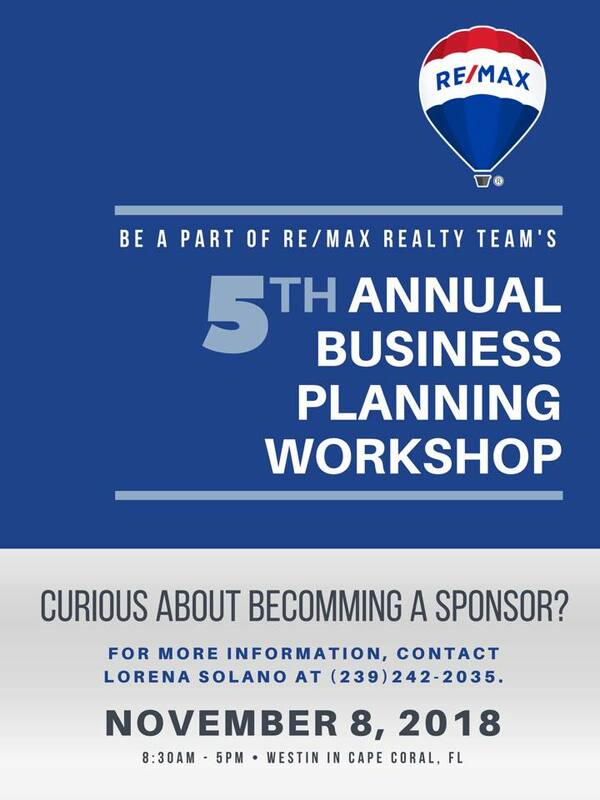 Yoselyn & Michael Hollow invite you to join the RE/MAX Realty Team and numerous agents from other brokerages throughout Southwest Florida for our 5th annual business planning workshop on November 8th, 2018. The workshop lasts from 8:30am until 5pm at the Westin Cape Coral Resort. During our business planning seminars you will learn how to properly structure your business for optimal growth to far surpass the goals you will set for the 2019 business year. At this event you will also have an opportunity to network with agents and numerous real estate affiliated companies throughout Southwest Florida. Our last event was a huge success with hundreds of agents attending. We look forward to seeing you on November 8th!